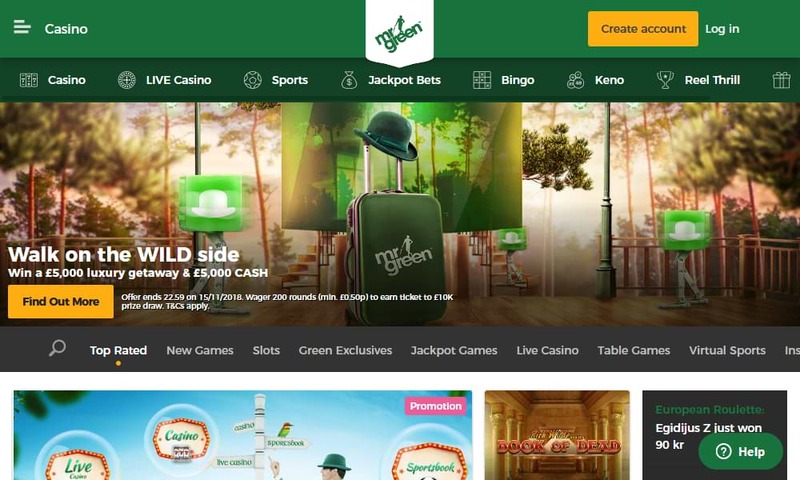 Launched in 2008, the Mr Green online casino has become one of the most popular virtual game rooms, and we are going to explain the reasons for this in the following review. The operator is one that stands out from the rest, and not just because of the adventures of their mascot Mr Green, also because of their outstanding game selection, bonus terms and many different attractive promotions. When visiting the website you will probably notice Mr Green on the sides of the background. Visiting the only casino on a larger monitor with a higher resolution will show you the background image. These images change regularly, depending on the seasons or special offers. The navigation of the site is very straightforward, and you will find an in-depth help and contact section on the right hand side by clicking on the small 'Help' tag. The games and the rest of the site are structured and intuitive to use. You can also find your way around the hundreds of games by clicking on the categories or typing in the name of the game directly. The game selection is what we are mostly interested in, as it is one of the most important aspects of an online casino. Mr Green is a multi-software casino and offers the games from different software developers Netent, Microgaming, Yggdrasil, IGT, Bally, Nextgen Gaming, Play'n GO, Merkur, Betsoft and Evolution Gaming. There are hundreds of games for every taste. The casino does not use a casino software, you can simply access the games from your browser. The selection of casino games is over 800 games strong! There are so many games, it is hard to choose a favourite. You can search by name of the game, or sort them by rating or by name. The selection of video slots offers a great variety of games with currently over 700 slot machines. For example, there are Betsoft 3D slots available, among them Good Girl, Bad Girl, Mr Vegas or SugarPop. The Netent range of outstanding slots is also available, and you can play hit games, such as Twin Spin, Starburst, South Park and many more. The casino also offers the Play'n GO range of games, some popular Merkur slots and Microgaming hit games. The selection of progressive jackpot games is very impressive. You can play some of the most popular pooled network jackpots, such as Mega Fortune, Hall of Gods or Mega Moolah, as well as a good selection of local jackpot games. There are currently 20 progressive jackpot slots different developers available. The casino also offers a huge selection of mobile games, among them the mobile Netent Touch slots, the Play'n GO mobile range, and many more. You can access the Mr Green mobile casino on many different iOS and Android devices. The casino does not just offer slots, you can also find a huge selection of classic casino games, such as roulette and blackjack. The operator is also connected to a live casino which allows you to enjoy a good selection of classic casino table games against real dealers in an authentic casino environment. You can play Roulette, Baccarat, Three Card Poker, Casino Hold'em and Black Jack in the Mr Green live casino. The overall game selection is outstanding and we have nothing to complain about. The operator regularly adds new games and ensures the players are not bored. Players wishing to get the real casino experience can play a game against a real dealer in the live casino and slots fans will find a huge selection of the best online slots. Mr Green prides itself by offering one of the most attractive casino welcome bonuses that you can get on the Internet. As a matter of fact, the welcome bonus terms are very fair to the player. You will first use your real money to play the games, and if it happens that you win, you can withdraw the amount and forfeit the bonus. This is usually not possible in other casinos. In case that you lose your real money you will get the bonus as a second chance for a win. The wagering requirements will then be 35 times before you can withdraw any winnings. The welcome bonus for new players is 100% up to €100 and 200 free spins. You can get the bonus with a minimum deposit of €/£20 and 100 free spins will be unlocked after you've wagered €/£20 in the games. You must wager the Welcome Bonus 35 times before it can be withdrawn. The free spins are available on the slots: Fruit Spin, Starburst, Aloha, Finn and the Swirly Spin, Asgardian Stones and Gonzo's Quest. You have must also wager your free spin winnings 35 times before you can request a withdrawal. You will also get another 100 free spins that are split up over the next 5 days with 20 spins each day when €/£20 or more is wagered. There is also an interesting welcome bonus for the sportsbook and for the live casino, if you are not really into the regular casino games. After the welcome bonus you can take advantage of regular promotions, such as prize draws, tournaments, deposit specials and cash drops. The promotions change regularly, so it is best to check the site regularly for new and exciting promotions. Unfortunately, the operator does not yet offer a loyalty point program, but there is a VIP club for high rollers. The Mr Green online casino has been around for many years and over time they built a large and happy player base. The operator is licensed with a remote gaming licence from the Malta Gaming Authority and is regularly tested for fairness of the games. All transactions are carried out through secured connections and the operator does everything in their power to protect your personal data from unauthorised access. Personal information is not handed to third parties. The customer service can be contacted 24/7 by phone, live chat and e-mail, and the friendly support representatives will give you a professional answer to your queries as soon as possible. Depending on the method used, the minimum deposit is between 5 and 10€/£. Using credit and debit cards will also incur a transaction fee of 2.5%. You will get one free withdrawal in a 7-day period, further withdrawals will incur a fee. Withdrawals are processed manually by the casino, and it can take between 24 and 72 hours before it is being processed, as several security checks are being carried out prior to processing. However, the withdrawals are usually processed very fast and there is no set withholding time. Over the years, Mr Green won a number of different awards, among them the IGA 2015 award for best online casino operator of the year. They have won this award for the third time in a row. We can highly recommend this operator, and you can be certain to be in good and safe hands when playing here.